Each rope that is connected to a trap is also connected to a buoy. This is very helpful in locating the traps. The hydraulic silver system you see in the picture pulls the rope that is connected to the trap up and out of the water. 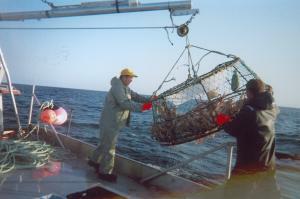 The fishermen can then unload the trap.